Bee Pollen is made by honeybees, and is the food of the young bee. It is considered one of nature’s most completely nourishing foods as it contains nearly all nutrients required by humans. Bee-gathered pollens are rich in proteins (approximately 40%protein), free amino acids, vitamins, including B-complex, and folic acid.Bee pollen is a complete food and contains many elements that products of animal origin do not possess.Bee pollen is more rich in proteins than any animal source. It contains more amino acids than beef, eggs, or cheese of equal weight. About half of its protein is in the form of free amino acids that are ready to be used directly by the body.It is important to recognize that a one teaspoon dose of pollen takes one bee working eight hours a day for one month to gather. Each bee pollen pellet, contains over two million flower pollen grains and one teaspoonful contains over 2.5 billion grains of flower pollen.Dr. 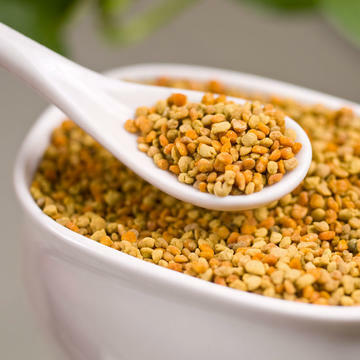 Gabriel Cousens MD, has listed bee pollen as one of his 22 most recommended food energies.Bee Pollen can be used medicinally for a wide range of conditions from prostate health to skin conditions and can help correct specific nutritional imbalances within the body. enhancing stamina and fighting off fatigue. inflammatory effect on the tissues of the lungs, preventing the onset of asthma. 4. Treating Allergies –Pollen reduces the presence of histamine, ameliorating many allergies. Dr.
against a wide range of respiratory diseases. from the food that you eat. antioxidants that protect the cells from the damaging oxidation of free radicals. into this benefit, particularly when it comes to weight management. pollen. Bee pollen can help reduce inflammation to stop frequent urges to urinate. 2. Add ground bee pollen to cooling homemade granola while it is still moist and sticky. some skin diseases and alleviate migraines. Pyridoxine (vitamin B6) – Required for the formation of hemoglobin and used to combat nervousness,fatigue, muscular weakness, brain tumors, anemia, Parkinson’s disease, arteriosclerosis ofthe brain, and radiation sickness. Pantothenic Acid (Part of B-complex) – Effectively speeds the cure of wounds, gangrene, various ulcers,herpes, bedsores, inflammatory infections of the mouth, colds, bronchitis, infectious hepatitis and minor skin problems. Ascorbic Acid (vitamin C) – Stimulating anti toxic effects. Beneficial against colds, respiratory distress, and is useful in metabolizing calcium. properties and improves blood circulation.